This plant prefers more open and sunny parts of the tropical rainforest, so is therefore common along tracks, rainforest edges and gaps. It is a member of the family Urticaceae. The leaves and stems are covered in thick hairs that, if touched, inflict a painful sting. These hairs are manufactured from mineral silica, the chief constituent of glass. If you brush against them, their tips penetrate the skin, break off, and release an irritant poison. The effect of this sting may last for months. There is no effective antidote known for the stinging tree, so visitors must always be aware of these plants. It is either a single stemmed herb with stems up to 5cm wide, or a sparingly branched shrub which stands 1-5 metres high. The leaves are large and broad, consisting of an oval or heart-shaped blade that can grow up to 30cm long and 22cm wide. The leaf stalk is usually 5-15cm long. Male and female flowers are on separate plants. They have very small flowers gathered in open bunches called panicles in the forks of leaves. 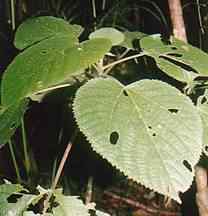 Considered the most dangerous plant in the Daintree, the dreaded 'Stinging Bush', or 'Gympie-gympie' belongs to the family Urticaceae, which contains other stinging nettles of the northern hemisphere. The plant produces a cluster of watery red fruits just underneath the terminal leaves. The poisonous hairs also extend along the reddish stems and cover these red fruits. Large specimens can be seen in the Daintree lowlands such as along Jindalba and Kulki boardwalks, and it is a common plant on the sides of roads and clearing throughout the Atherton Tablelands.